Miracle Recreation's new MiracleTechTM integrated security system is designed to reduce or eliminate vandalism, loitering and crime at playgrounds and recreational facilities. This integrated system uses ultrasonic sound, lights and infrared cameras to keep an eye on what's happening around the clock. Featuring patent-pending technology, MiracleTech features SiteBriteTM lighting, ParkWatchTM video monitoring, plus the revolutionary SonicScreenTM vandal deterrent, which uses exclusive Mosquito technology to create a selective "sound barrier" that keeps loiterers and vandals away. Rely on Temporary Security Fences to differentiate yourself. Your activities deserve to be protected with style and security with unique temporary fences. Event organizers have been successful in limiting the risk of theft while influencing positive traffic flow. Temporary Fences and Barriers offer competitive pricing and superior protection over chain-link fences. All are made of all-weather and maintenance-free galvanized heavy-duty steel wire and are yellow coated. The 887 Utility Post from Lawrence Metal is a functional, cost-effective post that can accommodate a full range of sign holders and leaflet dispensers. This highly visible yellow post is ideal for crowd control and queue management in areas with high traffic levels like managed recreation sports and fitness markets. Other posts are available in a wide range of colors and finishes. Protect children and give parents peace of mind with Child Safety Wristbands from Precision Dynamics. They offer one of the easiest, least expensive ways to help improve the safety and well-being of children. With preprinted lines, you can a child's name, guardian name and emergency phone number in permanent marker. The wristbands are one-size-fits-all, secure and durable to stay put on active children. Field Trip wristbands with school contact information are also available. National Ticket Company manufactures tickets and wristbands used for admission control, pay-one-price admission, security, special privilege passes, group identification, restricted area access, and any application where a visual means of identification is needed. The company offers bright colors and designs of stock wristbands made of Tyvek®, double-numbered stub wristbands, holographic, vinyl and plastic wristbands. 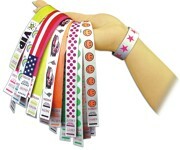 In addition, National Ticket prints ultra-hi-res, RFID, sta-put tab bands, stub bands and Ultrak Quik Wristbands. Public safety and security have become a necessary part of our lives. Wausau Tile's planters, bollards and benches are constructed of steel rebar that is encased in concrete. 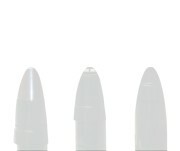 These units are installed at or below grade and have achieved crash ratings according to federal guidelines of K4, K8 and K12. They are an excellent choice when you need a cost-effective way to provide security without losing flexibility in design. MedTech's wristband line includes SuperTek, Plastic, Soft Comfort, Vinyl, EVO, Ultra-Security, Photographic, Lenticular and RFID wristbands, which are designed for short-term or extended wear. MedTech's manufacturing experience enables the company to provide unique products and services to help with group identification, guest registration, security controls, youth groups/summer camps and drinking-age verification. EZ ViewTM step option for pool liners is an innovative way to make vinyl-covered steps look good while improving safety. The product uses liner floor pattern over the steps with a welded white or blue stripe on each step where the riser meets the tread. The stripes are approximately 2 inches wide on the tread with an additional 2 inches on the riser. EZ ViewTM makes it easy for swimmers to see the steps while entering or exiting the pool and was created to meet consumer demand for safe steps that are also aesthetically pleasing.